Research has proved that music has a profound effect on our body and mind. Music therapy is often used to help cancer patients and children with ADD. An increasing number of hospitals and clinics are using music to help with pain management, for treating depression, and to aid in healing. There is no doubt that music affects the mind and body in many powerful ways. 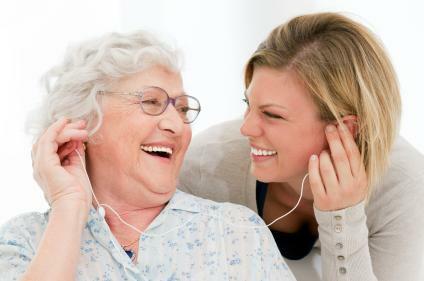 Caregivers are beginning to recognize the value of music’s therapeutic power and encourage its use in caregiving. The remarkable home care system and home care software ClearCare offers easily incorporates music into the daily lives of care patients. Music has been found to lower blood pressure – which may reduce the risk of stroke, boost immunity, ease muscle tension, and improve mental attitude. Recent research has also found music to spur communication and calm individuals with dementia. A recent experience in New York City highlights the value of musical therapy. Twenty-two individuals – half with early- to middle-stage dementia, the other half caregivers – make up New York’s first-ever chorus known as The Unforgettables. Mark Mittleman, an epidemiologist at New York University Langone Medical Center, tracked the group before they started rehearsing, midway through, and after the group’s first concert. After 13 rehearsals and final concert, the entire group displayed better self-esteem and mood, experienced less depression, and enjoyed better quality of life. ClearCare has always encouraged agencies to do whatever it takes to make life more enjoyable for their clients and have developed an outstanding home care system and home care software program including features that can incorporate music into daily care plans. Numerous studies have proven the benefits of listening to music – whether the client prefers classical, jazz, or “oldies” from the 50s and 60s. Incorporating music into the daily lives of dementia and Alzheimer’s patients may bring especially positive results. Home care software can easily remind caregivers to incorporate music into clients’ daily activities. Once a caregiver or agency makes a note in a web-based home care system, such as ClearCare, that a particular client enjoys music, this information is always available and accessible. Caregivers can create reminders in their daily care plans that will prompt them to turn the radio on, find a TV station that plays music, or put a disc into a CD player. Care providers can also keep track of what type of music each client prefers, as well as how it benefits their mood and overall health. Caregivers that use a resourceful home care system or home care software can use this technology in the field with the assistance of a mobile tablet, such as an iPad. This device can be used not only for care management, but is also valuable for musical therapy. Clients will be amazed at the array of musical choices available using the iPad- all at the touch of a screen. While one senior might simply enjoy listening to the soothing sounds, another might be moved to get up and dance! ClearCare understands the value of music and is proud to offer a home care system and home care software program able to incorporate musical therapy into daily care. How has music benefited your family? Drop us a note and share your experience!